Blaise Cendrars, one of twentieth-century France's most gifted men of letters, came to Hollywood in 1936 for the newspaper Paris-Soir. Already a well-known poet, Cendrars was a celebrity journalist whose perceptive dispatches from the American dream factory captivated millions. These articles were later published as Hollywood: Mecca of the Movies, which has since appeared in many languages. Remarkably, this is its first translation into English. Hollywood in 1936 was crowded with stars, moguls, directors, scouts, and script girls. Though no stranger to filmmaking (he had worked with director Abel Gance), Cendrars was spurned by the industry greats with whom he sought to hobnob. His response was to invent a wildly funny Hollywood of his own, embellishing his adventures and mixing them with black humor, star anecdotes, and wry social commentary. Part diary, part tall tale, this book records Cendrars's experiences on Hollywood's streets and at its studios and hottest clubs. His impressions of the town's drifters, star-crazed sailors, and undiscovered talent are recounted in a personal, conversational style that anticipates the "new journalism" of writers such as Tom Wolfe. 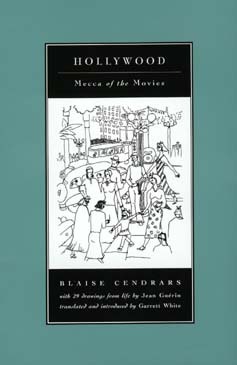 Perfectly complemented by his friend Jean Guérin's witty drawings, and following the tradition of European travel writing, Cendrars's "little book about Hollywood" offers an astute, entertaining look at 1930s America as reflected in its unique movie mecca. Blaise Cendrars (1887-1961), poet, novelist, essayist, cineaste, is a central figure in French modernist literature. In 1992 California published his Complete Poems. Garrett White has written on film/art for The Los Angeles Times and Premiere.